I'm pleased to announce that I'm hosting a summer songwriter's retreat in August called "Catie Curtis at the Cove," (Robinwood Cove) on Georgetown Island, Maine. It's a GORGEOUS setting, and there's no better time to be by the water in Maine. Get away from the hubbub of your daily life and come to an island to rediscover your muse. Each day, you will have the time and space to work on your craft in a setting breathtakingly beautiful. Songwriter Jenna Lindbo, sculptor Scott Stoll and I will be there to offer feedback sessions and workshops, as well as the time and space to be creative. I look forward to retreating with you! More info and an online application at Catie Curtis at the Cove. Applications will be accepted from February 4 to May 1, 2013. We may add a fall session if there's enough interest! 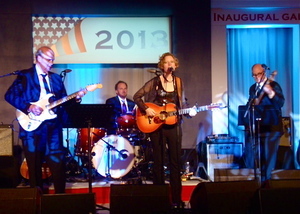 It was an honor (and a blast) to play at one of the Inaugural Galas. If you are a friend or fan on Facebook, you may have seen a couple photos. If not, connect now via Facebook! Shows are coming up in March, mostly in the Northeast and Mid-West. Two shows co-headlining with David Wilcox! Check it all out here: Catie Gigs.